Comprehensive review of Tree of Life Retinol Serum. See how this retinol cream compares against other wrinkle creams! The results I achieved from Tree of Life Retinol Serum were extremely disappointing. Tree of Life Retinol Serum feels like most serums… wet and gel-like on the skin. At first, it does leave a sticky residue on the skin. But once it dries down, that goes away and it completely absorbs into the skin. I really don’t like the smell of this product; it smells very strong and almost has the smell of alcohol, which is super off putting. I didn’t notice any changes the first day after trying Tree of Life Retinol Serum besides for my skin did feel a little bit dry. Other than that, I really didn’t notice any changes at all. Over time, my skin became very dry from using this product and it began to flake and look red. Besides the adverse effects, I noticed absolutely no difference in my fine lines or wrinkles- if anything, the dryness of my skin made my wrinkles stand out. Overall, Tree of Life Retinol Serum didn’t work well for my skin at all and didn’t help improve the texture or appearance of any wrinkles. The texture of Tree of Life Retinol Serum is kind of like any other serum… it has a wet, gel-like consistency. Once applied on the skin, it feels wet and kind of sticky as you rub it into your skin. The applicator is a dropper bottle, and you really only need a few small drops to cover your whole face. A little goes a long way. It’s pretty easy to apply and spreads out really easily since the consistency is pretty thin. Once it’s applied on the face, it will take about 30 seconds to fully dry. It does feel pretty sticky when it’s drying down, but soon after it dries, the stickiness goes away. The smell of Tree of Life Retinol Serum isn’t very pleasant; it smells kind of strong and almost has an alcohol smell. The scent lessens after the product dries on the face but it doesn’t completely go away. Short term I didn’t notice any difference at all. Long term I noticed that my skin became very dry and flakey. I felt like my skin was getting worse, not better. There was absolutely no improvement in fine lines or wrinkles. If anything, the dryness made the fine lines worse. I was very disappointed with the results I experienced from this product. Tree of Life Retinol Serum has many ingredients in it that are supposed to help with anti-aging. Hyaluronic Acid is supposed to instantly improve fine lines and wrinkles because of its moisture replenishing abilities. It’s thought to help resurface the outer layer of skin giving it a younger and healthier look. Witch Hazel is thought to help reduce the appearance of fine lines and wrinkles by tightening and smoothing out the skin due to the tannins it contains. Aloe is known to heal the skin from any damages such as sun damage and even wrinkles. It’s supposed to help heal and plump wrinkles and reduce aging to the skin. These three ingredients are big fighters against the aging process to the face. 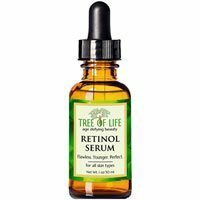 The cost of Tree of Life Retinol Serum is $10.75 for 1 oz which comes to $10.75 per oz. This is a relatively normal price for a retinol serum. Unfortunately, there is not a money back guarantee for Tree of Life Retinol Serum. To buy Tree of Life Retinol Serum, click here. Texture/Feel Serum that is gel-like and wet. Application Easy to apply and only require a little product. Drying Time Dries within about 30 seconds. Smell Smells strong and bad… a bit like alcohol. Long Term Results Long term made the skin very dry but didn’t improve wrinkles or fine lines. Ingredients It contains witch hazel which helps smooth the skin.